Since 2000 the Cunningham Law Firm has obtained in excess of $210,000,000 compensation on behalf of our clients. The Cunningham Law Firm specializes in personal injury, wrongful death and burn related cases. 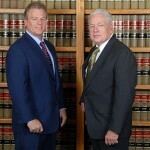 Matthew B. Cunningham and James P. Cunningham have been partners at the Cunningham Law Firm for more than 25 years. Together, Matt and Jim Cunningham bring 70 years of experience in handling catastrophic injury and wrongful death cases. They have obtained some of the highest personal injury verdicts and settlements in Arizona state history. In fact, since 2000 the Cunningham Law Firm has obtained in excess of $210,000,000 compensation on behalf of our clients, either through settlement or jury verdicts. At the Cunningham Law Firm, our team is committed to building close relationships with our clients; trying to understand as best as possible the tragedy and suffering they have experienced. As a successful personal injury law firm, the driving force behind our achievements is that we always do whatever is necessary to help our clients achieve justice. Often that means spending a significant amount of money during the development and preparation of a case for trial. We will bring forth whatever resources are necessary to give their case the greatest opportunity for success, including employing the best experts not just in Arizona, but from across the United States. Discover the lengths we go to by reading a few of our case summaries here. The Cunningham Law Firm is listed in The Bar Registrar of Preeminent Lawyers. Both Matt and Jim maintain Martindale-Hubbell’s highest “AV” rating based upon the reviews of their fellow Arizona attorneys. We are proud of the fact that The Bar Registrar includes only select law practices; those lawyers that have earned the highest rating in the Martindale-Hubbell® Law Directory and have been designated by their colleagues as preeminent in their field. We have also been listed as one of Phoenix’s top law firms by Phoenix Magazine and Top Attorneys in Arizona (May 2013 issue of Phoenix Magazine). We are also pleased to be part of the Union Lawyer Referral Program, and are delighted to provide legal services for members of nine local Unions. We work on a contingency fee basis, which means our clients owe no fee unless we obtain a recovery for them. Our team is here to help with your personal injury or wrongful death case. Contact us at 602-257-1750 or use the form below to arrange a free consultation to discuss your situation. Please remember that we work on a contingency fee basis; our clients owe no fee unless we obtain a recovery for them. Disclaimer: Using this website or sending us an email does not create a binding contractual relationship with Cunningham Law Firm. This website and the Free Consultation Form have been prepared by Cunningham Law Firm for potential representation and evaluation only. Any information you provide will be confidential and not disseminated to anyone.